1 reset button & 1 general use button. Can be directly connected with Raspberry Pi. 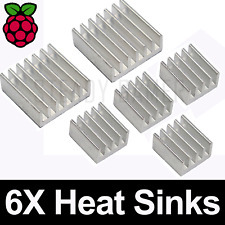 - 3PCS Raspberry Pi 2 & 3 Aluminium Heatsink Kit Self Adhesive Heat Sink. - Self Adhesive Heatsink. - Specially designed to replace the fan operated Heatsink. Compatible with all versions of Pi including the new Pi 3 B . Keep your Pi cool with these high quality aluminum heat sinks. 2 x 14x14x5mm Aluminum Heat Sink. 4 x 9x9x4mm Aluminum Heat Sink. Cooling Aluminium heatsinks for Raspberry Pi Ver. Heatsink only, Raspberry Pi Board and enclosure are not included. 30pcs x Heatsink. Material: Aluminium. Help keep your Pi cool while overclocking. 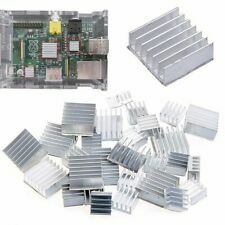 Raspberry Pi aluminium heatsink set. This set consists of 3 heatsinks. All three heatsinks have quality 3M thermal pads and are very easy to apply, just peel and stick. They also fit perfectly in our laser cut acrylic Raspberry Pi cases. 1 reset button & 1 general use button. Can be directly connected with Raspberry Pi. - 3PCS Raspberry Pi 2 & 3 Aluminium Heatsink Kit Self Adhesive Heat Sink. - Specially designed for Raspberry Pi. - Self Adhesive Heat Sink. 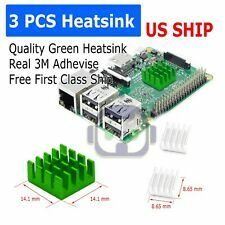 3PCS Raspberry Pi 2 & 3 Aluminium Heatsink Kit Self Adhesive Heat Sink. - Self Adhesive Heatsink. - Specially designed to replace the fan operated Heatsink. - Cools down the CPU and other components as well as fanned heatsink. 1 x Copper Heat Sink. 1 x Aluminum Heat Sink. Material: aluminum copper. Color: brass black gold. 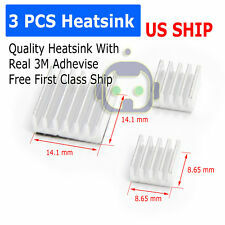 3PCS Raspberry Pi 2 & 3 Aluminium Heatsink Kit Self Adhesive Heat Sink. - Specially designed for Raspberry Pi. - Self Adhesive Heat Sink. - 2X 14mm CPU Heat sink. - 4X 8.65mm Heat Sink. - Original 3M Heat Transfering Adhesive on the heat sinks. 3 Piece Heatsink for Raspberry Pi. Peel the protective liner off on the base of the heatsink. 1x 14mmx14mmx6mm Aluminum Heatsink. 2x 8.8mmx8.8mmx5mm Aluminum Heatsink. These heatsinks have a layer of thermal adhesive that allow for easy installation on to your board. 30pcs x Heatsink. Cooling Aluminium heatsinks for Raspberry Pi Ver. Heatsink only, Raspberry Pi Board and enclosure are not included. Help keep your Pi cool while overclocking. Material: Aluminium. Black Case with 3 Piece Heatsink for Raspberry Pi. Compatible with Raspberry Pi B , 2, and 3. Peel the protective liner off on the base of the heatsink. 1x 14mmx14mmx6mm Aluminum Heatsink. 2x 8.8mmx8.8mmx5mm Aluminum Heatsink. This is a heat sink cooling kit for Raspberry Pi 3 Model B. Our heat sink kit will give your Raspberry Pi 3 the best protection. High Quality Heatsinks bring your Raspberry Pi perfect heat dissipation. DESIGNED FOR PI 2 & 3: The Kintaro custom heatsink cooling system is one of our accessories designed to be compatible with the Raspberry Pi 2 and 3 Model B single board computer. Black Case with 3 Piece Heatsink for Raspberry Pi. Raspberry Pi is not included! Compatible with Raspberry Pi B , 2, and 3. Peel the protective liner off on the base of the heatsink. 1x 14mmx14mmx6mm Aluminum Heatsink. 14mm(L) x 14mm(W) x 6mm(H) Heatsink for Soc. 8mm(L) x 8mm(W) x 4mm(H) Heatsink for LAN9512. 10x 14mmx14mmx6mm Aluminum Heatsink. 20x 8mmx8mmx4mm Aluminum Heatsink. 200Pcs Glass Fuse Tube Axial With Lead Wire Fast Blows Fuse 3x10mm 250V/1A US. Specially designed for Raspberry Pi. Self Adhesive Heat Sink. Suitable for Raspberry Pi models A, B, B , 2, and 3 boards. Raspberry pi not included. Set of 8 aluminum heat sinks. Model: LYSB01GE7Q060-ELECTRNCS. DESIGNED FOR PI 2 & 3: The custom heatsink cooling system is one of our accessories designed to be compatible with the Raspberry Pi 2 and 3 Model B single board computer. Protecting your Raspberry Pi from overheating is essential when you’re overclocking, spending hours retro gaming with RetroPie, or for any other resource hungry projects which can really test your single board computer. Set of two. One large, one small. help prolong the life of your pi by helping cool the system. 14mm(L) x 14mm(W) x 6mm(H) Heatsink for Soc. 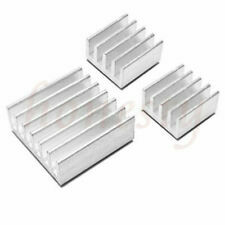 8mm(L) x 8mm(W) x 4mm(H) Heatsink for LAN9512. 10x 14mmx14mmx6mm Aluminum Heatsink. 20x 8mmx8mmx4mm Aluminum Heatsink. Do you want to run your Raspberry Pi at 70°C?. If the answer is no, then you need this heatsink kit. 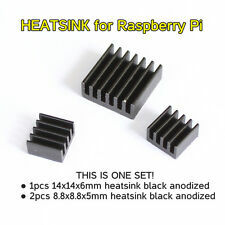 You can keep your Raspberry Pi cool by installing these heatsinks. 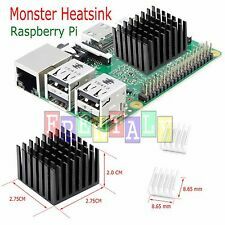 1setAluminum Cooling Heatsink for Raspberry Pi 3, 2 & B . Compatible with all models of Raspberry Pi, including 1, 2, 3, and Zero, as well as many other single board computers. Contains: 3 heatsinks: 1 large heatsink, 2 small heatsinks. 2 pieces 9x9x4mm. (not including raspberry pie motherboard). Size: 25 25 16MM. Fan: 5V 0.15A. 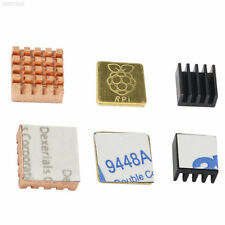 I hate the noise of the small fan for raspberry 3 / 2B. big heatsink x 1. Small heatsink x 1. Aluminum is enough, because it is big enough. 1 Dual Cooling Fan for 2B 3B. (not including raspberry pie motherboard). - Noise: 30DBA. - Net weight: 32g. 1set Aluminum Cooling Heatsink for Raspberry Pi 3, 2 & B . (not including raspberry pie motherboard). Heatsink Kit Aluminum Copper 3M 8810 thermal conductive adhesive tape for cooling cooler Raspberry Pi 3 B , Pi 3 B, Pi 2, Pi Model B . Suitable for Raspberry Pi 3, 2, A, B, B boards. Raspberry pi not included. This is a heat sink cooling kit for Raspberry Pi 3 Model B. Best protection for Raspberry Pi 3 Model B. Our heat sink kit will give for Raspberry Pi 3 the best protection. Top quality heat sinks bring for Raspberry Pi perfect heat dissipation. Specially designed for Raspberry Pi, it's function is to cool down the board and make your Raspberry. 3Pcs Aluminum Cooling Heatsink. The product is new, never used and in good conditon, just go ahead and buy! Compatible with Raspberry Pi. 2Pcs Heatsinks. - 2 pcs of aluminum heat sinks. - Material : Aluminum. - Color : Black. Degign for Raspberry Pi 3B . Raspberry Pi Board is not included. And it fit for all of your case so that you do not need to buy another case for your raspberry pi. 1x Copper Heatsink. The fan is 3510 version and more powerful but still quite when it is running. Material: Copper. Color: Others. English Manual / Spec: No. PACKAGE INCLUDES 3x Raspberry Pi Aluminum Heatsink Set (not include the Raspberry Pi board and Case) SPECIFICATIONS Dimensions: 14*14mm 1pc 8*8mm 2pcs Type Heatsink Brand Unbranded/Generic MPN Does Not Apply UPC Does not apply. Black Case for Raspberry Pi. Compatible with Raspberry Pi B , 2, and 3. Protect your pi while staying in style with this low profile case. The case is a very stylish and sleek! 1x Low-Profile Black Case. This heatsink set is specially designed for Raspberry Pi, it's function is to cool down the board and make your Raspberry operate safely. 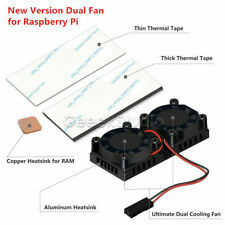 2 Pieces Black Aluminum Heatsink Cooler Cooling Kit for Raspberry Pi. This heatsink set is specially designed for Raspberry Pi, it's function is to cool down the board and make your Raspberry operate safely. - Exclusively made for Raspberry Pi B , Raspberry Pi 2. - Suitable for Raspberry Pi. Perfectly matched to Raspberry Pi's CPU. Copper Heat Sink 1pc. Aluminun Heat Sink 2pc. Material:Aluminum, Copper. ultra slim. Color:Oxidation Blue,black,yellow. And due to the difference between different monitors, the picture may not reflect the actual color of the item. Includes 6 pieces green anodized aluminum 3 pieces copper cooling pad shim heat sink set for Raspberry Pi models A, B, B , 2, 3b and 3b boards. These pure aluminum (6pcs) and copper (3pcs) heatsink include heat conductive 3M 8810 adhesive tape for optimum heat transfer. Suit for Raspberry Pi 3 B, Raspberry Pi 2 B, Raspberry Pi B . You just need an ideal heat sink to tackle this problem. Aluminium Heat Sink. This heat sink have adhesive thermal tape that can effectively transfer heat and provide better cooling effect.